?Tae kwon do? originated from Korea and is now one of the most popular worldwide martial arts. It has evolved into a form of self defence and even an Olympic level game! Does your child have energy to burn? Taekwondo is a well-rounded kids’ activity that is suited to many different personality types. Shy kids could benefit from increased confidence, and outgoing or active kids may find the discipline and mental focus useful in other areas of their lives. While Taekwondo may be considered one of the more physical activities for kids, it’s relatively safe when supervised by a qualified and experienced instructor. Children are taught how to ‘fall’ in a way that minimises the risk of injury and aggression is discouraged. Not sure what age to start? 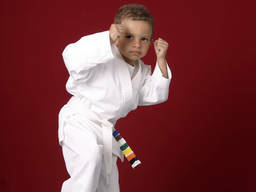 Most formal taekwondo lessons start around age 6 but some kids can start doing taekwondo related kids’ activities at a slightly earlier age. Taekwondo is a sport that is suitable for both boys and girls. How can you organise Taekwondo lessons and matches for your kids? Taekwondo lessons are usually undertaken with an instructor at a taekwondo school. Programs run during term times with special classes and camps during school holidays for kids who want to spend extra time training. Children generally start with the basic principles of taekwondo, moves and games for kids and progress to attaining different levels or ‘belts’ over time which can give them a great sense of accomplishment and pride. Some protection is necessary, so gear is required and this can usually be supplied by the school. Uniforms will be needed at an additional cost. If your kids are looking for a fun way to get fit which includes much more than just a physical workout, consider giving taekwondo a go!